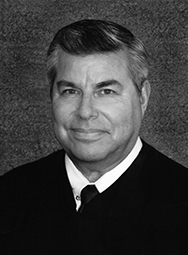 Presiding Justice James A. Ardaiz was appointed to his current position by Governor Pete Wilson in 1994. He was elected to the Municipal Court of the County of Fresno in 1980 where he served as Assistant Presiding Judge and twice was elected Presiding Judge of the Municipal Court. In 1983 he was appointed to the Superior Court of the County of Fresno by Governor Deukmejian where he served as a trial judge and as Presiding Judge of the Criminal Department. In 1987 Governor Deukmejian appointed him to the Court of Appeal where he served as an Associate Justice until his nomination to be Presiding Justice. Prior to his service on the bench, he was Chief Deputy District Attorney of the County of Fresno in charge of homicide prosecutions. He graduated from California State University Fresno in 1970 and received his law degree from the University of California, Hastings College of Law in 1974. He has been an instructor at California State University Fresno in the area of criminal law and evidence and is currently a Professor of evidence at San Joaquin College of Law where he has been twice selected as outstanding teacher. He has long been involved in judicial and legal education having served on the faculty of the California Judicial College at Boalt Hall, University of California, Berkeley as well as giving numerous lectures to California judges in the fields of evidence, criminal law and trial practice. He has lectured to the judiciary of the state of Hawaii and has lectured at and been a consultant to the FBI Academy at Quantico, Virginia in the field of DNA evidence. He has served on the Judicial Council of the State of California by appointment of Chief Justice Malcolm Lucas and served as Chairman of the Executive Committee of the Judicial Council by appointment of Chief Justice Ron George. He is a co-author of California Evidence and also has been a contributing author to Matthew-Bender on California Family Law. He is a consultant to the California Judges’ Benchguide on Felony Sentencing, the California Criminal Pre-trial Proceeding Deskbook, the California Criminal Trial Deskbook, and the California Criminal Posttrial Proceeding Deskbook. He currently serves as Chair of the Task Force for the State of California on Trial Court Funding and Employees, established by the California State Legislature. He is a member of Pilgrim Congregational Church in Fresno where he has served on the Board of Trustees. His activities include being an active soccer coach as well as running and painting.